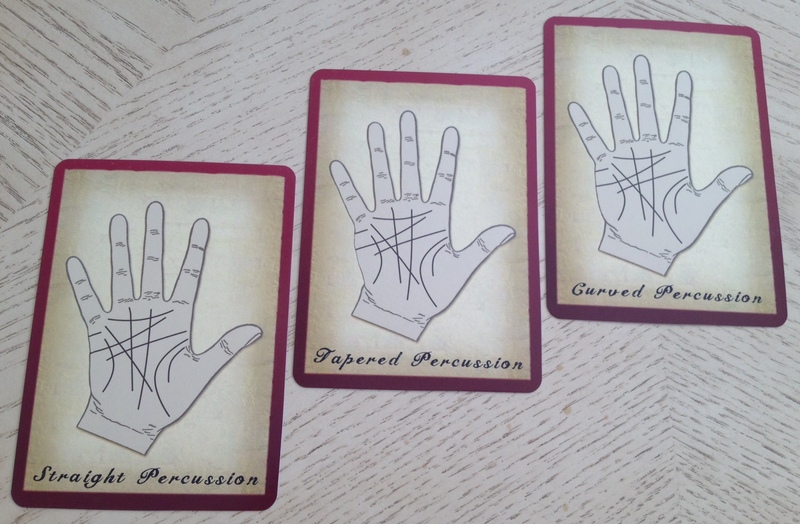 The Living Magick Learning Cards Series is one of those brilliant “now why didn’t I think of that” cool ideas that Jadzia and Jay DeForest have brought to life. The series is published by Living Magick Publishing and distributed through Devera. You can order these Learning Cards over at DeveraGifts.com. They’re basically $25 each, which is a great deal. As you can see from the above photo, I currently own the Palmistry, Tree of Life, and Tarot cards from the series. I’ll be reviewing each deck in turn. 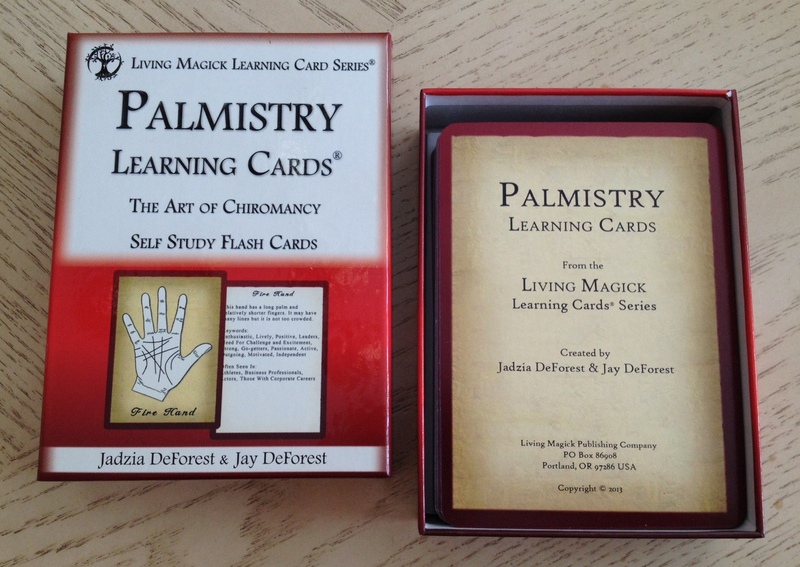 This review will be on the Palmistry Learning Cards: The Art of Chiromancy. They’re marketed as self-study flash cards. 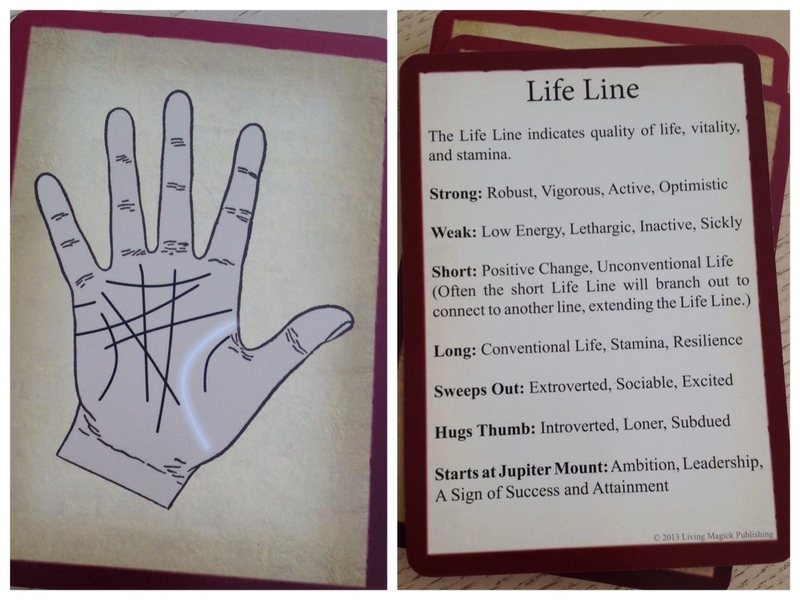 Since I’m a beginner when it comes to palmistry, I’m an ideal subject to be reviewing the deck to see if it can teach me palmistry. I’ve never been self-motivated to learn chiromancy, and subconsciously it may be attributed to what a big thing it is in my extended family. Palmistry reminds me of sitting on a bamboo mat in a muggy, humid family room in Tainan, Taiwan while an auntie tells me about my past life as she reads my left hand and then predicts who I’ll marry, how many children I’ll have, and how much money I’ll make as she traces the lines on my right. It’s never been something my rational mind could wrap around, so I never pursued it. But lately, I’ve been intrigued. This deck was exactly what I needed to actually give the study a whirl. I couldn’t find the number of cards in any of the product descriptions, so I counted them. Unless I counted wrong, there’s a total of 78 cards. That’s a ton! And it’s a ton of information, as you’ll realize from this review. The deck comes in a sturdy, laminated box. I love the design and feel of the cards. They’re big, just the right size to be reading off of. And there’s a little white booklet (LWB). 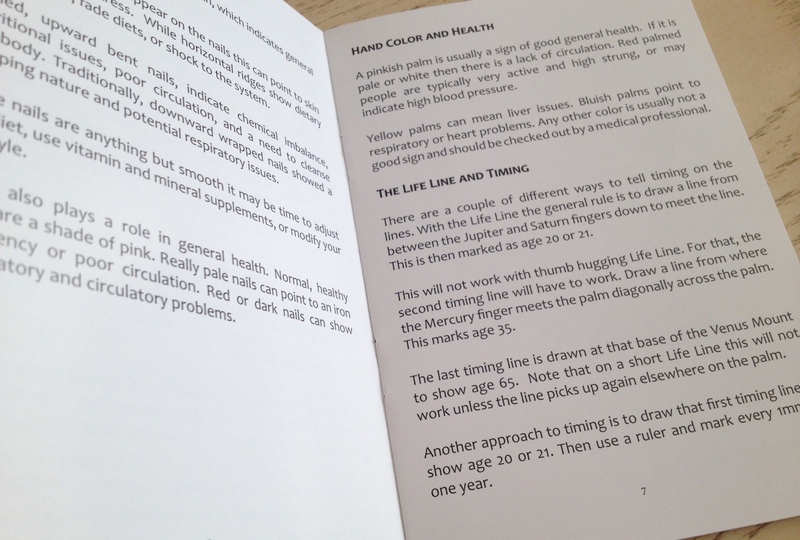 The LWB is full of substantive info, like how to tell time in palmistry. 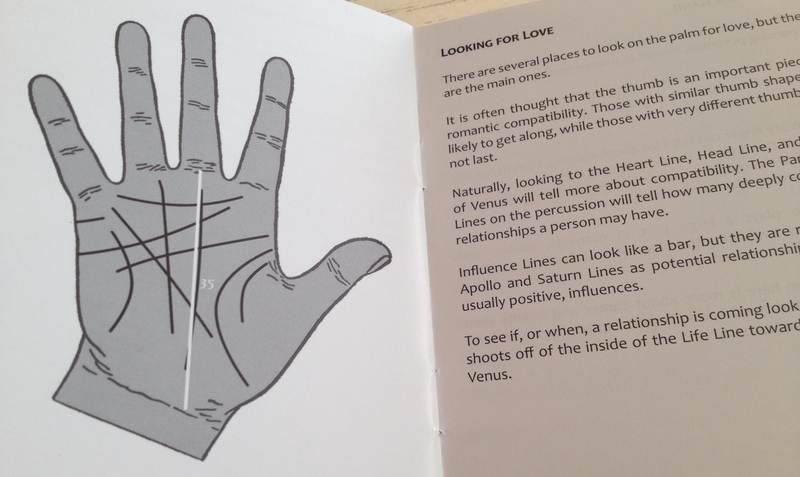 There’s also information on how to read your palm for assessing love and for assessing personal wealth. I have a very, very minor gripe about the lack of a groove-thingie on the sides of the box. I’ll show you what I mean in the next photo. The lack of a groove-thingie makes the box a little hard to open. I have to shimmy and yank it apart. See the Tarot Learning Cards from the Series? It’s got a groove-thingie. That semi-circle cut-out in the center is what I’m calling a groove-thingie. The groove-thingie makes it a whole lot easier to open the box. Without it, like the Palmistry box, I couldn’t get a good grip. But again, it’s not that big of a deal. The first thing I learned about myself through palmistry is that I have a Water Hand. 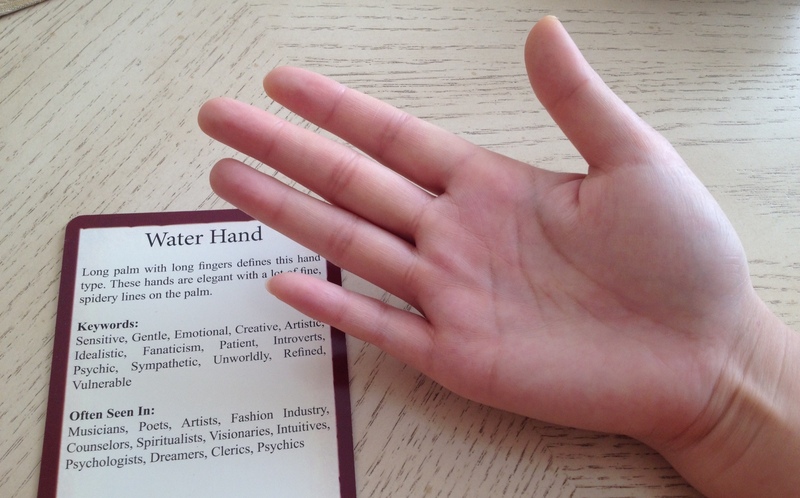 Water Hands are when you have long palms and long fingers, and lots of fine, spidery lines on your palm. I recall as a kid a relative telling me I had musician hands, and that I was a day dreamer. That’s in line with what this card says. Check out the other hand types. The four types are named after the four elements: Fire, Water, Air, and Earth. Which one are you? Hubby has a Fire Hand, and again, quite spot on. He’s athletic, very sporty, very competitive when it comes to sports, and also holds down a corporate job. He’s in finance and is very much business-minded. You have cards that explain all the mounts on your hand. This part has always confused me, so this deck is immensely helpful in isolating each mount, explaining it in-depth, and allowing you to focus on the mounts one at a time. I feel like with a book, I’ll read everything all at once and absorb nothing. With these flash cards, I learn in baby steps and the information on each card really does sink in and stick. 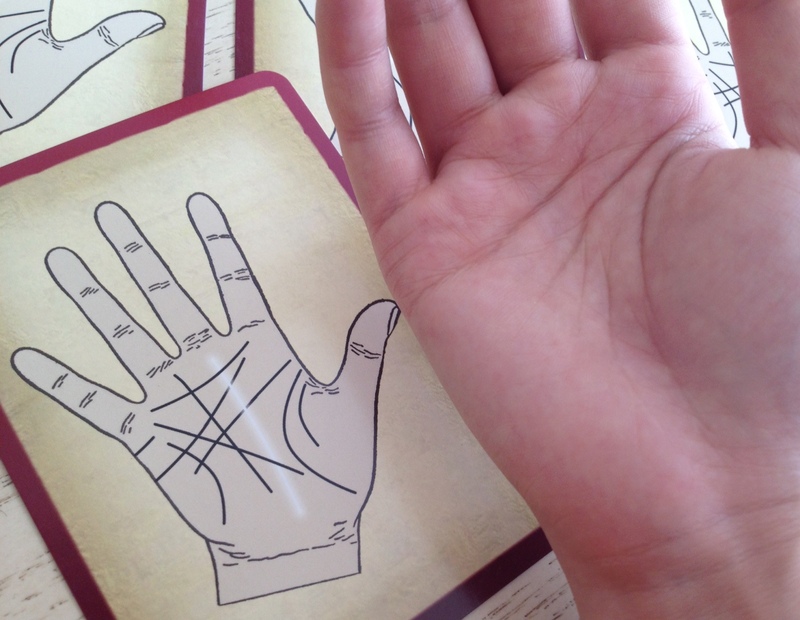 So it’s a really fantastic way of actually learning palmistry. Then we go through the fingers. Ooh! Let me see if I can recall the name of each finger (per palmistry lingo) without looking. Eeps. Didn’t pass. I got 2 wrong. I plumb forgot what the ring finger is called, and I thought the thumb was Venus. The mount near the thumb is Venus, but that finger is just “The Thumb.” Oops. The index finger is Jupiter. The middle finger is Saturn. And the little finger, the pinky, is Mercury. The ring finger is Apollo. That’s the one I forgot. The definition is in the LWB. Ah. Got it. A percussion is the side of the palm located below the little finger and ending at the wrist. So don’t throw out the LWB! It contains a master list of terminology that’s used throughout the cards. Having the definitions, maybe in fine print at the bottom of the cards, or something, might have been more helpful to a beginner. But at the same time, I can see how that might be annoying to an intermediate student who already knows what terms like percussion, phalange, mount, etc. mean. 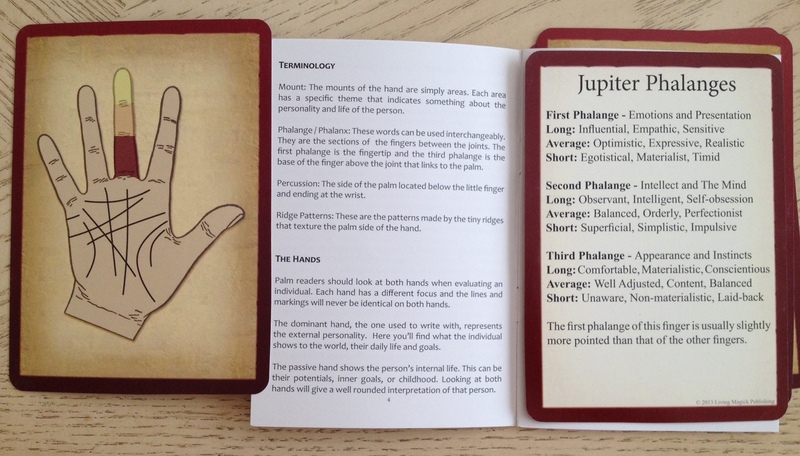 Nevertheless, as I went through the cards one by one, I was impressed with the clear, concise explanations that were easy for me to follow, I’m now very confident I’ll be able to learn palmistry. 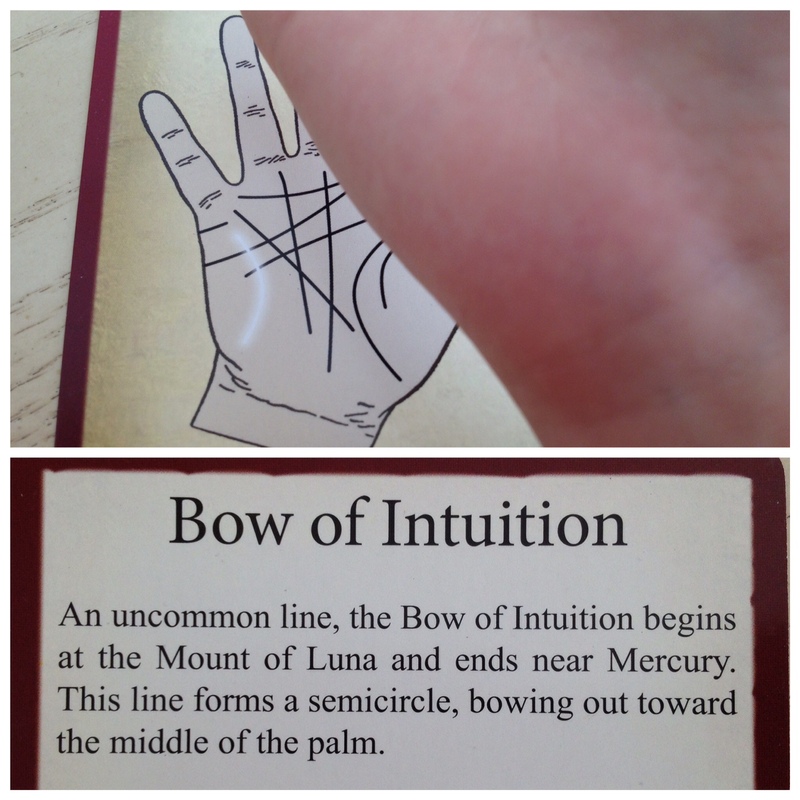 I’ve already begun reading palms for some of the basic lines! So these cards really are great. They get you to learn–and retain–knowledge quite quickly. One thing that has always confounded me was which hand to read. Everyone says something a little different about this. Growing up, my understanding was already divided. Some Chinese readers say that the left hand is your most recent past life while the right hand is your present. The left hand changes only has your present life free will decisions alter your karma. Or something like that. Other Chinese readers say that men should read the right hand and women should read the left. 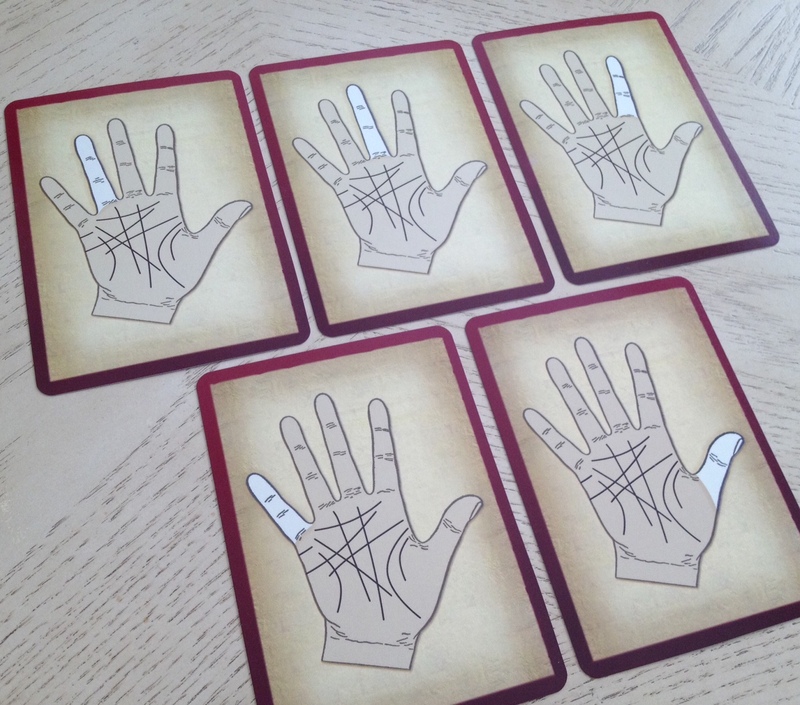 In the Learning Cards, the LWB says to read both hands. 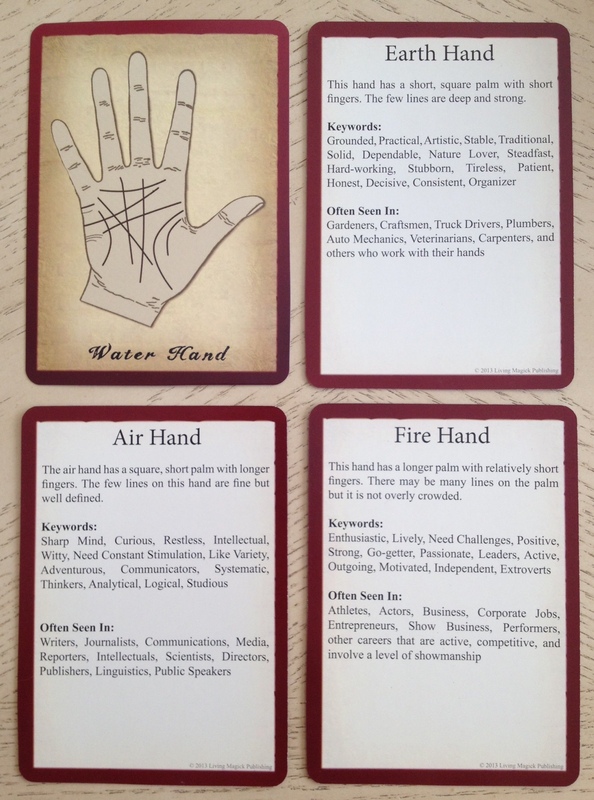 The dominant hand, whichever one that is, will reveal the external personality, or persona. The passive hand will show the internal sphere, the subconscious, childhood, latent attributes, or inner goals. I’m ambidextrous. In everyday activities, my right hand is my dominant, but in woo-woo crafty metaphysical mojo stuff, my left hand is my dominant. So what would I do? In terms of percussions, for instance, my left hand features a straight percussion, which suggests, basically, a lack of creativity (the verbiage says it nicer and more eloquently, don’t worry), and that I’m not in touch with my intuition. 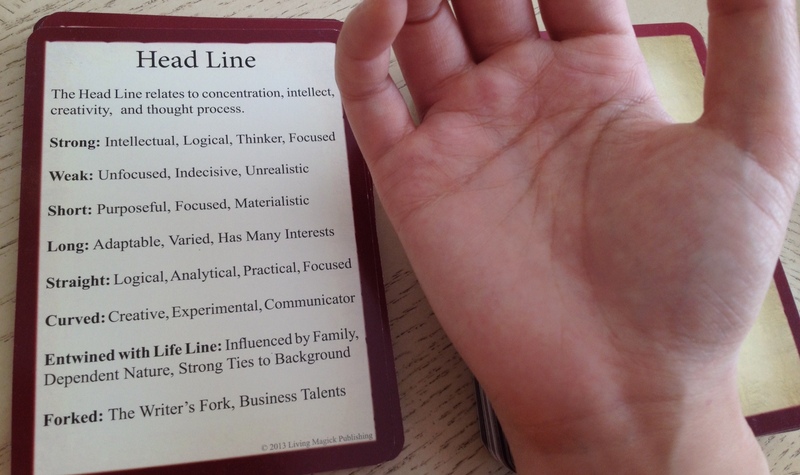 But my right hand features a tapered percussion, which would mean I’m thought-oriented, mentally active, a planner, thinker, and ideas generator. The tapered percussion also means I’m probably high-strung (again, verbiage says it nicer, i.e., “they can have a very difficult time relaxing”). Interesting. 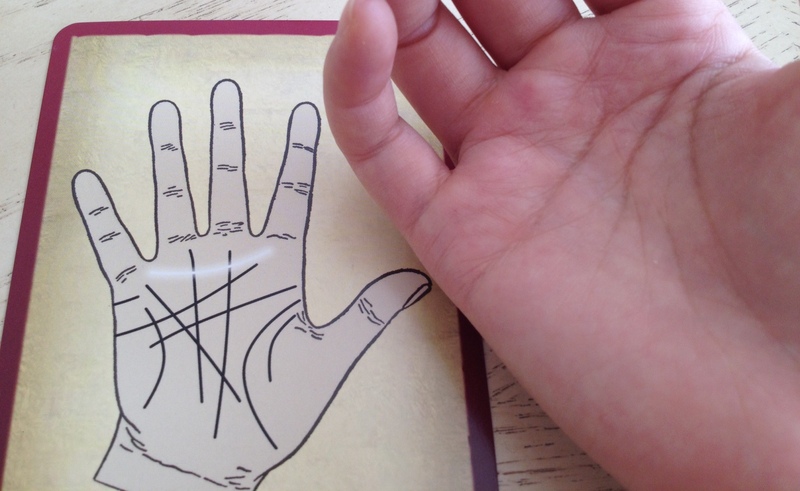 The LWB also recommends using a magnifying glass and a little flashlight when reading palms. I dig that idea. I just happen to have a really nice magnifying glass sitting out on a display table in my front sitting room. That means visitors to my home for the next few months are going to get cornered by me and their palms read. 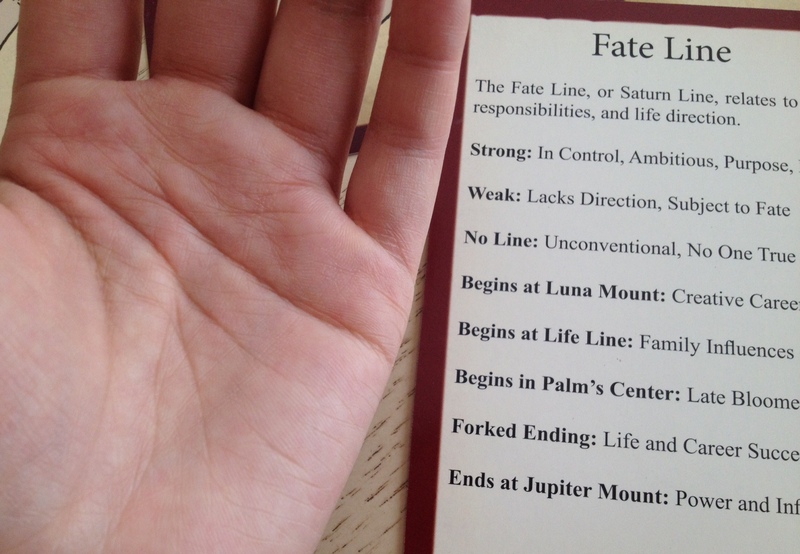 Apparently, I have one now, only the fate line on my left hand differs substantially from the fate line on my right. Back in my youth when I had no fate line, I guess that meant I was unconventional, with no one true path. Nice, nice. In adulthood, I’d consider the fate lines on both hands rather weak, so I guess that means I lack direction and am subject to fate. I’m not so sure how true that first statement is. I tend to be the stark opposite of that, at any given moment singularly focused on a goal and paving a straight and narrow line toward that goal, damned if you get in my way. But the second statement might be true, being subject to fate. Then we get into some of what I’d call the intermediate stuff, that you wouldn’t know about at all unless you’ve studied palmistry to some measurable degree. The Mars Line, Girdle of Venus (which I think I have… faintly. You’ll see in the above photo that it appears to be broken; I have a broken Girdle of Venus…). The Girdle of Venus means I love beauty and creativity (I would claim that’s true) but extremely emotional and sensitive (I would claim that’s not true). Although the LWB says the deck only teaches the fundamentals, I felt like these cards dive rather deep into chiromancy. It addresses all the different types of breaks and broken lines that might appear on a hand and what each represents, all the different types of patterns, finger tips, and types of nails. These 78 cards are chock full of information. 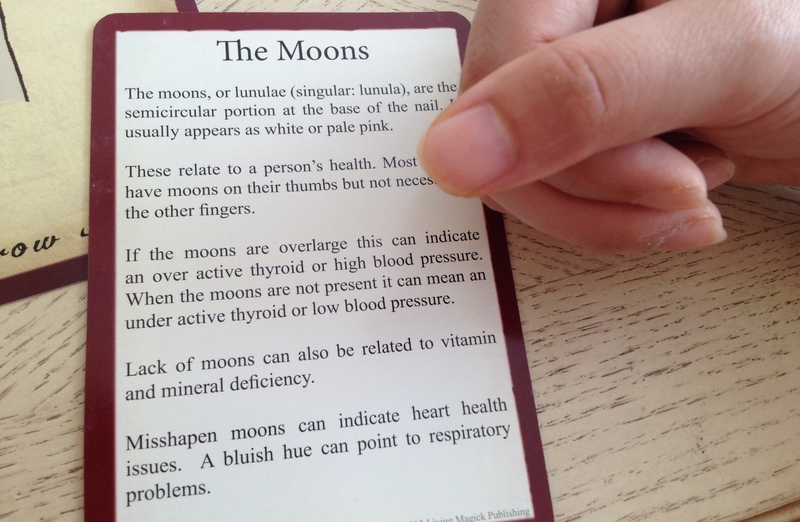 Another aspect of palmistry that’s always interested me are the nail moons. These are those white semicircles near the base of your nails. As you can see, I don’t seem to have any moons to speak of. Yikes. According to the card, I lack vitamin and mineral deficiency! In contrast, every one of Hubby’s fingernails has a clear and distinct moon. The deck really does cover so much. 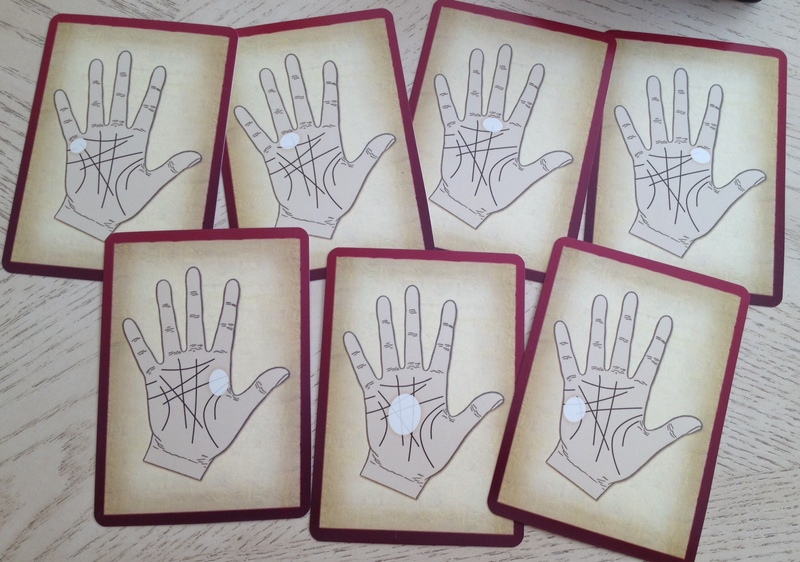 Here you see cards on the phalanges. Yeah, I had to look that up. I mean, I knew what it meant; I just didn’t know which was the “first phalange,” the second, etc. According to the LWB, the first phalange is the fingertip third. The second is the middle third. The third is the base third of your finger, where it connects to your palm. 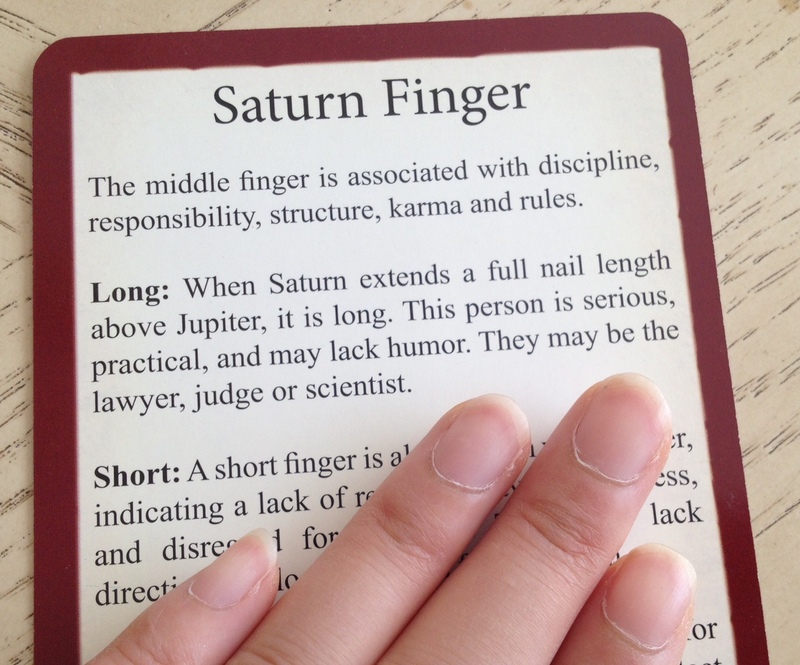 I was intrigued by what I learned about my Saturn finger (the middle finger) was spot on. Everything the deck had to teach about the Saturn finger or the Saturn mount was eerily correct for me. In the photo above, the angle makes determination a bit confusing. When my fingers are relaxed straight up, the ring finger is well below the base of the middle finger nail (i.e., a long Saturn finger). You can use the Learning Cards the way you use a reference book, except it’s easier and more convenient. I can pull out the “pages” or cards I want to consult. The info is a lot more succinct than a book. You can also use them as flash cards for learning. So, for example, I might see the card at left and use it to quiz myself on what that line is. Then I can flip the card over to check my memory. 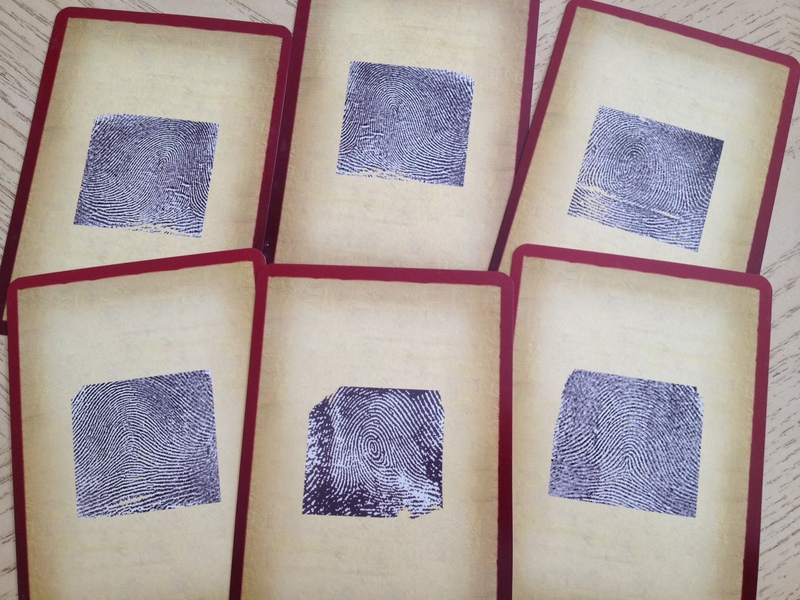 The below sort of shows what I did with my personal copy of the Learning Cards. Everything else, which turned out to be about half the deck, stuff like Ulna Loops (um, what? ), Peacock Eyes, the little lines, ornamentation lines, everything else and anything that I was like, “You know what? I’ve never even heard of that.” cards went into the “More Advanced.” That pile I’ll tackle later after I’ve gotten a good handle on my “Beginner” pile. So for anyone curious, that’s how I’m studying with my Learning Cards. 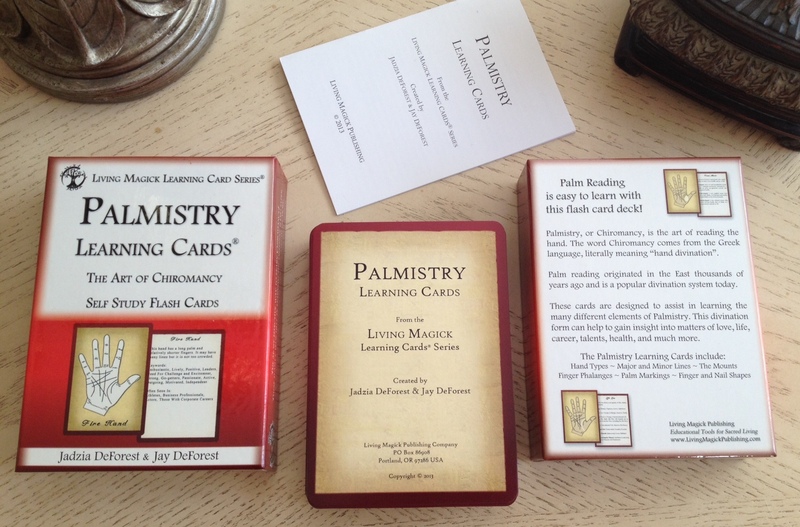 If your goal is to learn palmistry and have that be one more “woo thing” under your belt, then the Palmistry Learning Cards by Living Magick really is the most efficient way to learn it. 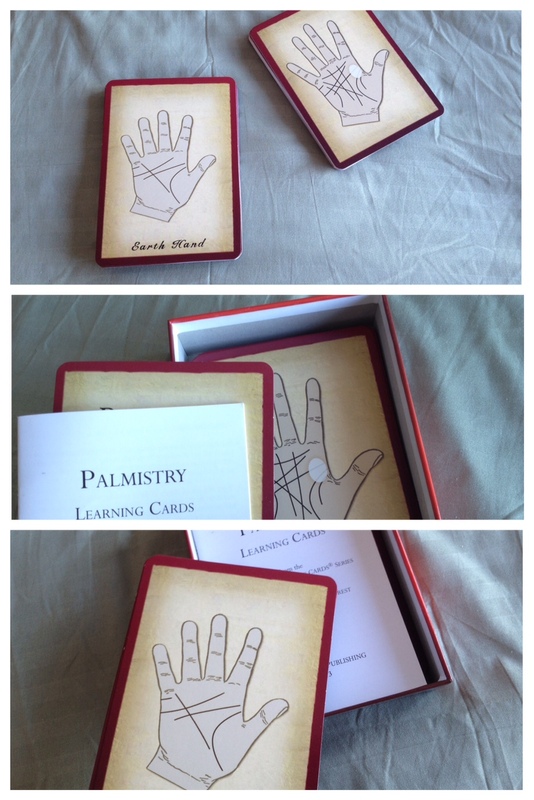 You can order your Palmistry Learning Cards over at DeveraGifts.com or check it out at LivingMagickPublishing.com. Loved this, I was quite interested in this particular one when you put an image up on Instagram 😀 I have a Bow of Intuition on my left (non dominant) hand but not one I can see on my right, at least without the requisite flash light 😀 And I have water hands as well, great review, thank you! Neat! 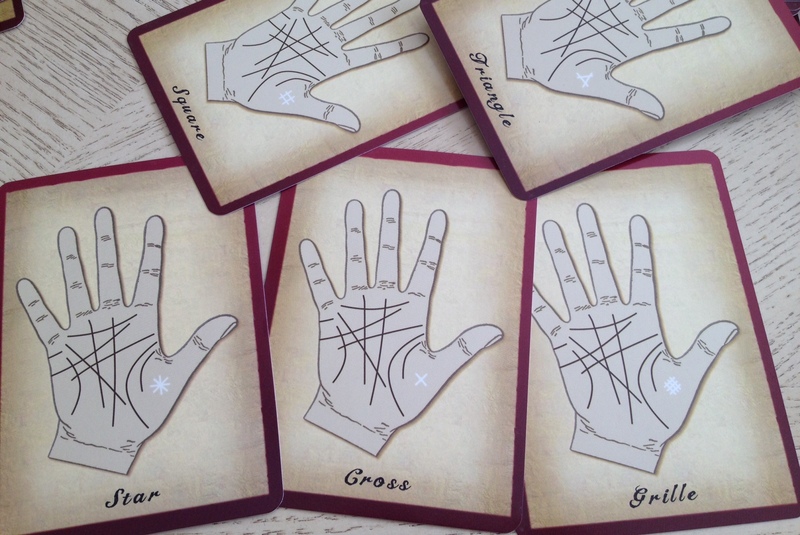 If you want to pick up a basic knowledge in a particular metaphysical study, like palmistry, then these flash cards are really good. I’ll also be reviewing the Kabbalah and Tarot ones at some future point.